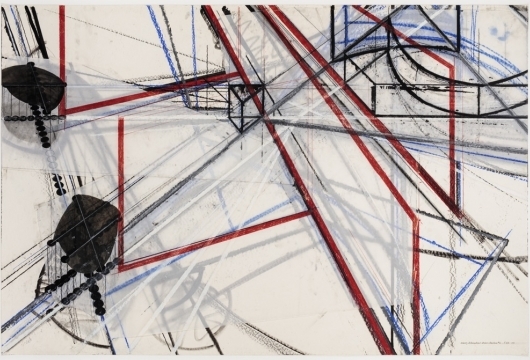 Nolan/Eckman Gallery is pleased to announce the opening of Barry Le Va, 9g Wagner Diagrams ICA Variations. On view will be new large-scale brown ink collages, each demonstrating Le Va's process of finding the correct variation from which he draws upon to complete wall and floor installations. These drawings develop further Le Va's first use in 2003 in Zurich of two-dimensional, thick rubber mounted on board. The New York Times critic, Roberta Smith, firmly places Le Va in the generation of 1960's artists who "replaced sculpture's rigid structure with a new sense of flexibility in terms of time, space, process and perception." Barry Le Va was born in 1941 in Long Beach, California and currently lives in New York City. This will be Le Va's fifth exhibition at Nolan/Eckman, and it runs in parallel to Barry Le Va: Accumulated Vision, a retrospective of Le Va's drawing and sculptural installations at the Institute of Contemporary Art in Philadelphia, on view from January 15 through April 3, 2005.